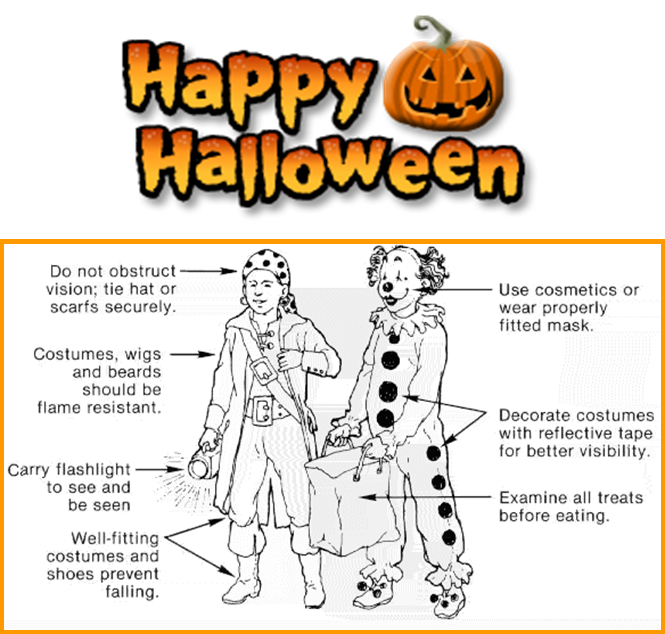 Provide children with flashlights or glow sticks to carry while trick-or-treating. Add reflective tape to costumes to make them more visible to drivers. 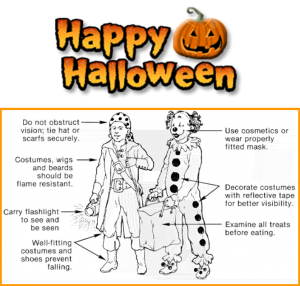 Be sure children wear only flame-retardant costumes. Avoid baggy arms, long costumes and trailing material. They are also a tripping hazard. Masks can obstruct your vision; use make-up instead. Keep flammable decorations away from heat sources, such as candles, heaters, and stoves. Hay, corn stalks, and dry flowers are highly flammable. Avoid decorating with candles. Use flashlights instead. However, if you choose candles for decorations, place them in a sturdy holder out of reach of kids and away from combustibles.